Have you been considering the purchase of an Asus Eee PC, but thought “that’s too cheap,” and decided against it? With a price tag of $299 for the 2GB version, who could blame you? Don’t worry, CybertronPC is here to help you out. 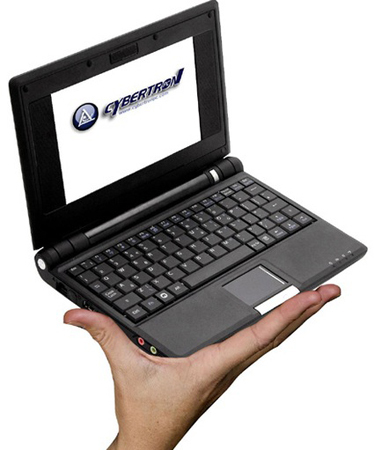 You’ll notice that the picture above looks like a black Asus Eee PC, only with a giant hand and a Cyberton logo. If you were to dig a little deeper and check out the specs, you’d soon realize that it is in fact identical. You’ll get an Intel Celeron M 910GML, 512MB of DDR2, 2GB of SSD storage and a 7-inch screen. The real difference here is that you’ll have to fork over $349 instead of $299 for an identical Eee PC. This is the sort of thing that really upsets me. There will be uninformed consumers out there that see this tiny computer for $349 and think it’s a great deal, not knowing about the Eee PC, and thus get ripped off. Maybe there’s something special here that I’m missing, but I highly doubt it.